My rating: 8/10. Michael Kors rose gold PVD plated watch. Quartz powered timepiece. Hello, today I’m doing a Michael Kors MK5774 review. 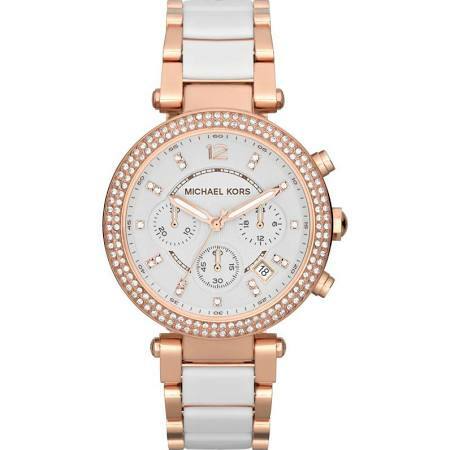 Micahel Kors are one of the most popular brands when it comes to ladies designed watches. This model features a beautiful stone set bezel with a rose gold PVD plated casing. I hope you enjoy this Michael Kors MK5774 review below. This Michael Kors watch features a stunning stone set bezel that sorrounds a white chronograph display. This elegant looking timepiece has stone set hour markers, a date function, and luminous hands for easier reading in dim lit conditions. The casing is made of steel with a PVD rose gold plating to give the watch this beautiful luxury finish.The crown is located at the 3 o’clock position with a pusher either side to operate the chronograph functions. Protecting the dial of this Michael Kors watch is a mineral crystal glass. This mineral crystal glass has been specially hardened to make it extra resistant to scratches and knocks. It’s often found on many watches in this price range. Powering this Micharl Kors timepiece is a reliable and accurate Japanese quartz movement. 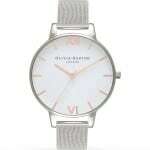 These and commonly found on watches in this price range as they’re affordable and require very little maintenance. The casing diameter of this Michael Kors watch comes in at approximately 39mm with a 12mm thickness, making this a slightly larger ladies watch. These bigger watches have been becoming more and more popular as of lately though. The strap is made of a plastic resin acetate with a rose gold PVD two tone finish. The strap measures 18mm in width and fastens with a push release fold over style clasp. Band: Acetate strap, standard length, 18mm width, push release fold over clasp. As with any item that is stone set like the bezel of this watch is, you run the risk of stones falling out over time. This is something that can happen to any item in time, and just worth keeping in mind. Overall, this is another great Michael Kors watch that’s proved popular over time for its beautiful design and affordable cost. Hope you enjoyed this Michael Kors MK5774 review. Find more watch reviews below.